On the 29th (Sat), enjoy the sand and surf at Kirra Beach, then enjoy the sand and surf at Burleigh Heads Beach, and then enjoy breathtaking views from SkyPoint Climb. 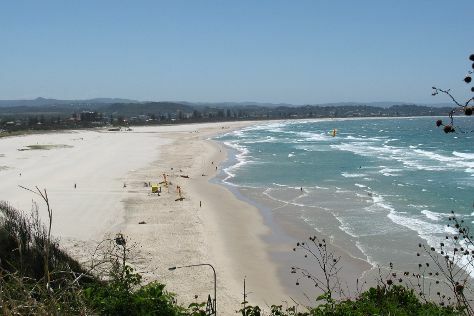 Keep things going the next day: enjoy the sand and surf at Greenmount Beach, then kick back and relax at Coolangatta Beach, and then kick back and relax at Burleigh Head National Park. For more things to do, where to stay, other places to visit, and more tourist information, read Gold Coast vacation planning site . San Francisco, USA to Gold Coast is an approximately 19-hour flight. You can also do a combination of subway, flight, and train; or do a combination of flight and train. Due to the time zone difference, you'll lose 18 hours traveling from San Francisco to Gold Coast. In December, Gold Coast is warmer than San Francisco - with highs of 81°F and lows of 67°F. Finish up your sightseeing early on the 30th (Sun) so you can travel to Cape Tribulation. You'll explore the less-touristy side of things at Daintree Rainforest - Cooper Creek Wilderness and Thornton Beach. Relax by the water at Myall Beach and Cow Bay Beach. Spend the 31st (Mon) exploring nature at Daintree National Park. The adventure continues: admire the sheer force of Alexandra Bay Waterfall and get great views at Walu Wugirriga Lookout. To see traveler tips, other places to visit, where to stay, and tourist information, you can read our Cape Tribulation online road trip planner . Do a combination of flight and bus from Gold Coast to Cape Tribulation in 9.5 hours. Alternatively, you can do a combination of flight, shuttle, and bus; or drive. Traveling from Gold Coast in December, expect Cape Tribulation to be a bit warmer, temps between 88°F and 73°F. Finish your sightseeing early on the 2nd (Wed) so you can travel to Port Douglas. Start off your visit on the 3rd (Thu): look for all kinds of wild species at Wildlife Areas. Here are some ideas for day two: soothe aching muscles at some of the top local wellness centers and then look for all kinds of wild species at Agincourt Reef. For maps, where to stay, ratings, and more tourist information, go to the Port Douglas trip itinerary maker app . You can do a combination of car and ferry from Cape Tribulation to Port Douglas in 2 hours. Another option is to take a bus. In January, plan for daily highs up to 89°F, and evening lows to 75°F. Cap off your sightseeing on the 4th (Fri) early enough to travel to Magnetic Island. On the 5th (Sat), tour the water at your own pace with Big Mama Sailing, enjoy the sand and surf at Geoffrey Bay, and then head off the coast to Magnetic Island Forts Walk. For other places to visit, where to stay, reviews, and more tourist information, go to the Magnetic Island planner . Getting from Port Douglas to Magnetic Island by combination of shuttle, flight, and ferry takes about 5.5 hours. Other options: do a combination of car and ferry; or do a combination of shuttle, bus, and ferry. In January, daytime highs in Magnetic Island are 89°F, while nighttime lows are 77°F. Finish your sightseeing early on the 5th (Sat) to allow enough time to travel to Airlie Beach. Kick off your visit on the 6th (Sun): see some colorful creatures with a scuba or snorkeling tour. On the next day, explore the activities along Heart Reef, view the masterpieces at Above & Below Photography, and then add some adventure to your tour with a kayaking and canoeing tour. To find more things to do, reviews, traveler tips, and more tourist information, read Airlie Beach trip builder website . You can do a combination of ferry and car from Magnetic Island to Airlie Beach in 4.5 hours. Other options are to do a combination of ferry and bus; or do a combination of ferry, train, and bus. January in Airlie Beach sees daily highs of 85°F and lows of 76°F at night. Wrap up your sightseeing on the 7th (Mon) to allow time to travel to Cairns. You'll explore the less-touristy side of things at Historic Village Herberton and Australian Butterfly Sanctuary. Take a break from the city and head to Trinity Beach and Josephine Falls. Spend the 9th (Wed) wandering through the wild on a nature and wildlife tour. Next up on the itinerary: enjoy unforgettable views with a balloon tour and look for gifts at Australian Leather Company. To find where to stay, ratings, reviews, and tourist information, refer to the Cairns day trip planning tool . You can do a combination of ferry and flight from Airlie Beach to Cairns in 5 hours. Alternatively, you can do a combination of bus and flight; or drive. In January, plan for daily highs up to 89°F, and evening lows to 75°F. Wrap up your sightseeing on the 10th (Thu) early enough to travel back home.